Just fancy a few cheeky uplifts? Don’t forget, you can grab a single uplift for £4.00 or you can buy a five trip ticket for £17.50 if you just want to grab a few runs. 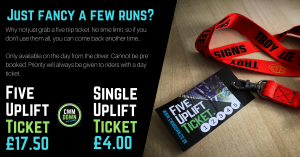 Five Uplift Tickets are only available on the day from the uplift driver and cannot be pre-booked. They are ideal during the week, when the uplift is not fully booked out, or at quieter times of the day, when you only want a few runs or don’t wan’t to spend all day here. You can only use this ticket if there is space on the bus, as priority is always given to riders with a Full Day Uplift Pass. So if you want a few sneaky runs over a busy weekend, you will have more chance of getting on if you arrive in time for the first uplift, or in the late afternoon once riders start to drop off, normally 3pm onwards. There is no time limit to use this ticket, so if you don’t use all 5 uplifts, just come back another day to use the others. We can only accept cash on the day for this ticket as we don’t have credit card facilities on site.